This activity started in 2010 is dedicated to the investigation of materials, alternative to standard noble metals, for the realization of plasmonic systems and optical metamaterials, active in the visible and mid/near-IR. This research deals with the high-throughput discovery and the characterization of the electronic and optical properties of plasmonic materials, based on first-principles (TD)DFT simulations. transparent conductors (e.g. Al:ZnO, Al-ZnS, InSnO, Ag-halides, Ta:TiO2, ITO), refractive ceramics, (e.g TiN, ZrN, TiC, ZrC), phase change materials (e.g. VO2, GeTe) and topologigal insulators (e.g. tetradymites). Particular attention is dedicated to the effects of defects, dopants and impurities on the optical and plasmonic properties of these materials, also through the simulation of X-ray spectroscopies (e.g. XPS, NEXAFS). D. Shah, A. Catellani, H. Reddy, N. Kinsey, V. Shalaev, A. Boltasseva, and A. Calzolari, "Controlling the plasmonic properties of ultrathin TiN films at the atomic level", ACS Photonics 5, 2816 (2018). M. Eaton, A. Catellani, and A. Calzolari, "VO2 as a natural optical metamaterial", Opt. Express 26, 5342 (2018). 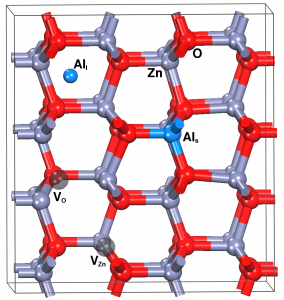 A. Catellani, A. Ruini, and A. Calzolari, "Optoelectronic properties and color chemistry of native point defects in Al: ZnO transparent conductive oxide", J. Mater. Chem. C 3, 8419 (2015). A. Calzolari, A. Ruini, and A. Catellani. "Transparent conductive oxides as near-IR plasmonic materials: the case of Al-doped ZnO derivatives", ACS Photonics 1, 703 (2014). Collaborations: S. Corni (Univ. Padova, IT), E. Molinari (UNIMORE,and CNR-NANO, IT), L. Bursi and P. Nordlander (Rice University, USA) e M. Stener (Univ. Di Trieste, IT). R. Zhang, L. Bursi, J. D. Cox, Y. Cui, C. M. Krauter, A. Alabastri, A. Manjavacas, A. Calzolari, S. Corni, E. Molinari, E. A. Carter, F. J. García de Abajo, H. Zhang, and P. Nordlander, "How to Identify Plasmons from the Optical Response of Nanostructures", ACS Nano 11, 7321 (2017). O. Baseggio, M. De Vetta, G. Fronzoni, M. Stener, L. Sementa, A. Fortunelli, and A. Calzolari, "Photoabsorption of Icosahedral Noble Metal Clusters: An Efficient TDDFT Approach to Large-Scale Systems", J. Phys. Chem. C 120, 12773 (2016). L. Bursi, A. Calzolari, S. Corni and E. Molinari, "Quantifying the plasmonic character of optical excitations in nanostructures from first principles", ACS Photonics 3, 520 (2016). L. Bursi, A. Calzolari, S. Corni, and E. Molinari, "Light-induced field enhancement in nanoscale systems from first-principles: the case of polyacenes", ACS Photonics 1, 1049 (2014). This activity is dedicated to the study of advanced materials for energy conversion. Materials of interest include both soft-mattter compounds and fibers (e.g. PVD-TrFE, PEDOT-Tos, graphene) for piezoelectric and thermoelectric applications at room temperature, as well as inorganic nanostructures (e.g. In:ZnO) for plasmon-assisted thermoelectric applications. The role of dopants/impurities is extensively took into account. 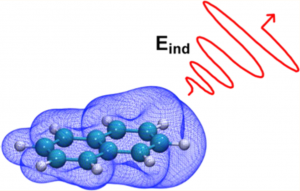 This studies rely on original finite-difference/finite-field approaches for the evaluation of both polarizability and vibrational spectra of materials. L. Cigarini, A. Ruini, A. Catellani, and A. Calzolari, "Conflicting effect of chemical doping on the thermoelectric response of ordered PEDOT aggregates", Phys. Chem. Chem. Phys. 20, 5021 (2018). L. Persano, A. Catellani, C. Dagdeviren, Y. Ma, X. Guo, Y. Huang, A. Calzolari, and D. Pisignano,"Shear piezoelectricity in poly(vinylidenefluoride-co-trifluoroethylene): full piezotensor coefficients by molecular modeling, biaxial transverse response, and use in suspended energy-harvesting nanostructure", Adv. Mater. 28, 7633 (2016). A. Catellani, A. Ruini, M. Bongiorno Nardelli, and A. Calzolari, "Unconventional co-existence of plasmon and thermoelectric activity in In: ZnO nanowire", RSC Adv. 5, 44865 (2015). This field of research is dedicated to the study of materials for disruptive nanoelectronic solutions, such as the brain-inspired synaptic electronics and neuromorphic computing. Modelling of these devices, e.g. 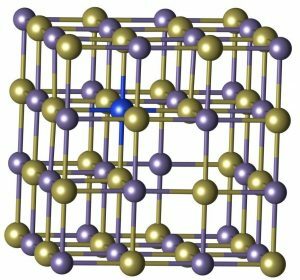 resistive-switching memory (RRAM), the phase-change memory (PCM), and the spin-transfer torque memory (STTRAM), rely on the investigation of materials at device level, where sub stoichiometric, defect aggregation and their (thermo)dynamics play a crucial role in the definition of the material itself. Studied materials include Ovonic Threshold Switching chalcogenides and Hf-oxide ferroelectrics.